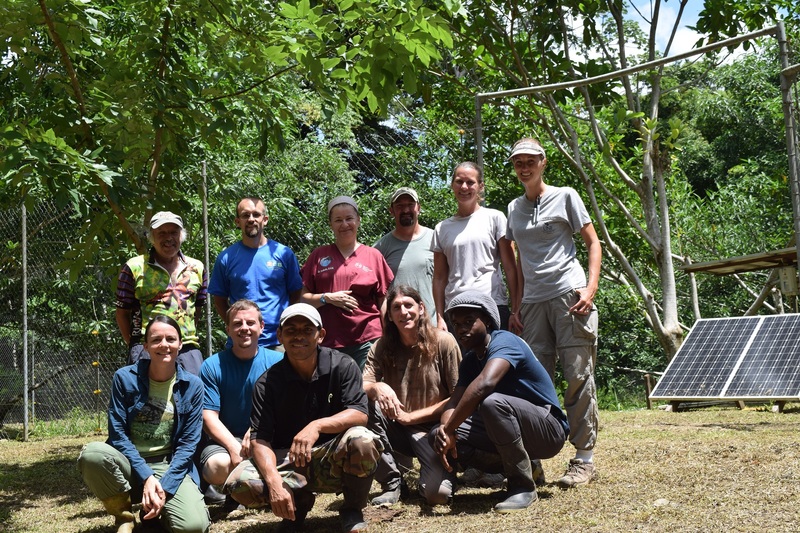 A team of veterinarians, zookeepers, researchers, and wildlife enthusiasts traveled to BFREE to perform health assessments on the turtles at the Hicatee Conservation and Research Center. 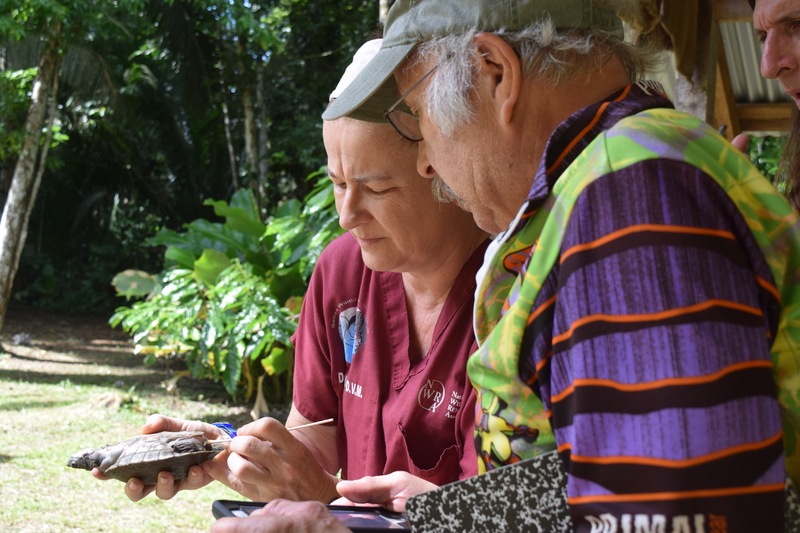 Our fall health check occurs when females likely have eggs, which allows the team to perform ultrasounds and determine the reproductive status of the turtles. Day 1 Examinations were performed on the 2017 and 2018 hatchlings. Under the guidance of Dr. Isabelle Paquet-Durand, a veterinarian at Belize Wildlife and Referral Clinic (BWRC), and Dr. Elliott Jacobson, professor and veterinarian emeritus at University of Florida, each juvenile was weighed, measured and given a thorough exam which included careful assessment of warts and abscesses identified during previous examinations. Overall, turtles showed positive growth rates and reduction in skin problems. The 2018 hatchlings were examined next – the veterinarians reviewed each of the 169 turtles which had already been weighed and measured on the 4th of September. Hatchlings also showed positive growth and good overall health. Day 2 Adults and sub-adults were netted from Pond B in the morning and Pond A in the afternoon. Forty-four animals were measured and weighed and given general health examinations. All breeding sized females also underwent ultrasounds to determine the presence of follicles and eggs. One of the adult turtles eluded the nets, as did all the captive-born three and four-year-olds. Gianni Martinez, teacher at St. Mary’s School in Belize City and author of “Herbert the Hickatee” joined the assessments on Day 2. Data collected during these assessments will add to the ongoing data set being constructed by staff of the HCRC. Additional photos of the Fall Health Check can be found here: Flickr page. 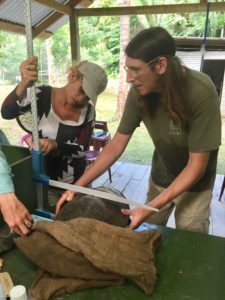 Thanks to the Turtle Survival Alliance for providing funding for the Fall Health Assessments, Jacksonville Zoo and Gardens for loaning the portable ultrasound machine, and Columbus Zoo and Aquarium for providing turtle diet for continued feeding experimentation on the hatchlings. Additionally, thanks the team who contributed time, energy and knowledge to this fall’s assessment: Dr. Isabelle Paquet-Durand, Dr. Elliott Jacobson, Thomas Pop, Jaren Serano, Nichole Bishop, Saul Bauer, Cayle Pearson, Stephanie Verhulst, Gianni Martinez, Richard Zerilli, Eric Anderson, Jacob Marlin, Heather Barrett and Hyla Marlin.